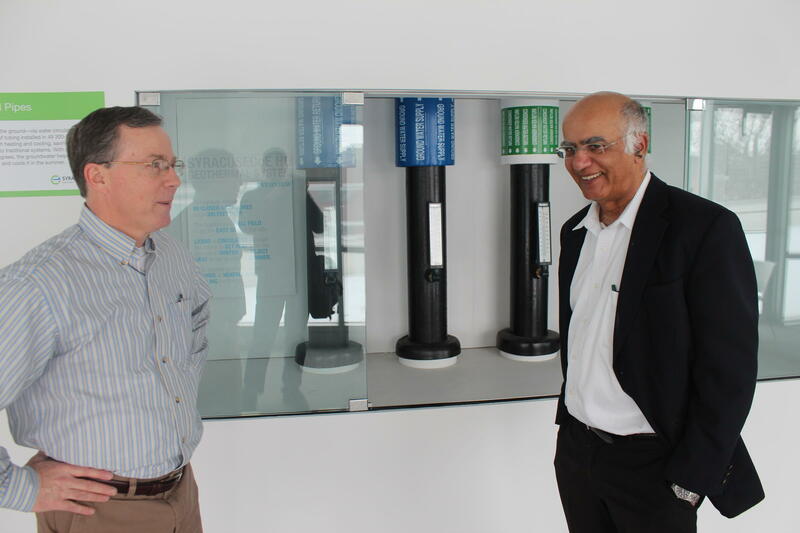 Institute for Energy and Environmental Research President Arjun Makhijani (right) looks at geothermal pipes at the Syracuse Center of Excellence. Converting from fossil fuel heating systems to electric will help meet New York state’s climate goals and make home heating more affordable, according to a new study. The initial cost of installing electric systems is steep but the report says there are ways the state could help. 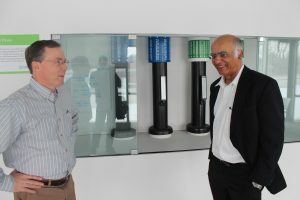 Institute for Energy and Environmental Research President Arjun Makhijani wrote the report that advocates for electric technologies like geothermal and cold climate heat pumps. The heat pumps reduce greenhouse gas emissions by using free energy from the ground and the air rather than burning fossil fuels. Makhijani said in the long-term, it will make home heating more affordable. But Makhijani said the challenge is the initial cost of installing these systems. Makhijani said there are multiple ways to reduce the costs and the state’s Energy Research and Development Authority has addressed the issue. Gov. Andrew Cuomo is also proposing a $15 million rebate plan for installing ground-source heat pumps. Makhijani said a state policy limiting energy costs for low-income residents to six percent of their income is another reason to push for the switch to electric. “Then the cost of heating goes down and the amount of public assistance money needed to help low-income households will also go down,” Makhijani said. Plus, Makhijani said New York could be a leader in manufacturing heat pumps and parts, which could lead to new jobs. Original story reprinted with permission of WRVO Public Media (State University of New York at Oswego). Interview took place on February 17, 2017.